Why not have dinner with family & friends and then head down to join everyone at TBYC to see in the New Year. The champagne is on ice and there will be dancing to DJ from 8pm onwards. No tickets – no charge – look forward to seeing you there. A double achievement for Daren Fitchew who followed up his Brass Monkey win, by today also winning the TBYC Frozen Sheets, whilst sailing his Sprint 15. Again another windy day, as Daren suggested had been in his advantage, it’s what he had been training for. Chris Boshier who also raced both races, had an unfortunate capsize during a gybe which left Daren with a 18 second corrected lead. We should not forget that Chris also sailed the double in his Contender last year. Gary Sverdloff sailing his Sprint 15 took 3rd place. Prize Giving took place after the race with Commodore, Beverly Warrington presenting the coveted prize. All other entrants were very happy that it was not the normal low winter temperatures but those more like Autumn, although the Rum Punch served by the Commodore and helpers was enjoyed by all. Saturday was a now common 5-6 (gusts even more) , so perfect weather for Daren Fitchew (and other members) to go off to Leigh for the day, sailing a Sprint 15. Having came second to Chris Boshier last year, he was keen to get the top spot. 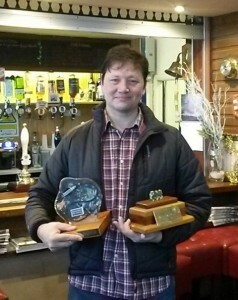 Well done to Daren for winning this years Leigh on Sea Brass Monkey Trophy. We understand he had a very good distance on all boats. Well done to the other sailors from TBYC that also sailed around in the exciting conditions. This does mean that we have now held the trophy for 3 years following two years of wins by Chris Boshier. The Frozen Sheets race will start at 11.30 on Sunday 27th December 2015. Frozen Sheets is an Open Meeting and we welcome all visiting sailors. Prize giving will be held in the main bar as soon as possible after the race finishes. Refreshments of Rum Punch and Mince Pies will be served in the Bosuns Hut. The RNLI are looking for a volunteer safety boat (fuel will be paid for) for approximately 1 hour to help out at the RNLI Sponsored Dip on Boxing Day at about 11.30am at Jubilee Beach. 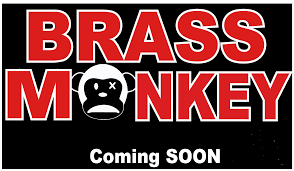 The Brass Monkey race will take place at Leigh on Sea SC on Boxing Day, open to all mono hull and catamaran classes. The course will start from the Leigh club start line near Chalkwell and will be around laid inflatable marks as described in the sailing instructions. The entry fee is £10 per boat. Cadet Christmas Party – Today! Please note that tickets are now sold out. We are unfortunately now unable to accommodate anyone who hasn’t already bought their ticket. For any non-member friends of members who requested places, if you haven’t received a phone call from me then I am sorry but afraid we were unable to accommodate you on this occasion. The main bar is being set up for the party at 2.30pm, so members are requested to utilise the Commodore Bar after this time – the bar will be open. The Sailing Committee met today and discussed the poor weather we have had during the Saturday and Sunday Winter Series and that the without three races, according to the Sailing Instructions each Series will not be valid. It is therefore planned, at the discretion of the Race Officer, to include an extra race on Saturday to complete the series. The weather has been reasonably mild, except for the wind and therefore we feel that this should be acceptable to all. We still plan to run a single race on Sunday. Cadet Christmas Party – this Sunday! Don’t forget to buy your ticket(s) for the cadet Christmas party which is taking place this Sunday at 3.30pm! Available from behind the bar and still at the bargain price of £5 each which includes party snacks, disco, games and a visit from Santa (plus a gift for all the good girls and boys! ).